Hello and welcome to this week's Handmade Monday. It might sound completely unrelated, but at the moment I'm reading Be a Free Range Human by Marianne Cantwell. There's a lot about this book that resonates with me, not least that it makes me realise it's perfectly OK to be dabbling in lots of things and not necessarily just picking only one thing to do for a career! And that I can concentrate on one thing for a while before moving on to another - and that is fine too. I've just read a chapter on how research is probably much less useful than creating prototype projects, and I've realised this is exactly what I'm doing on my new projects! I think this idea also fits in well with how I like to go about things - trying something out is a great way to see if it's a good fit for you. I'd guess that model would work for a lot of other people too. It's nice to see someone put a name to it! The free range aspect of the book's title is not just about the work you choose to do - it's also about where you choose to work - we're so fortunate today that the internet allows us to be connected pretty much wherever we are in the world and a growing number of people are making the most of that (actually that includes those of us who choose to work from home as well as those who work on the beach!). It's an enthusiastic and motivational book, and even though it's not focused on handmade or crafts, the theories fit superbly with the handmade lifestyle and ethos. It's not the cheapest of books but I would thoroughly recommend it (no, I'm not being paid in any way!). In other news, I've almost finished the heart shaped scissor pockets I talked about here, and I've been doing some sewing with my granddaughter too. More about that later in the week. I think I'm a bit of a free range human - I have moved about and done so many different things in my life so fa, mainly whatever takes my fancy at the time. The only down side I have found to this is when you need to describe to someone what you do - some people struggle if you won't fit in a box! Can't stop long - have to go and order that book! I've been doing such a lot of thinking and my plans are getting into place. Love that picture of the coastal cottages - the sea is awesome. Isn't it exciting when freedom seems like it might just happen! It is odd that we need someone to affirm that what we are doing is ok. (In fact I find it slightly annoying) but I know that feeling so well. I am really good at wasting time researching rather than doing, so I try to do more! Your paintings look lovely - make me think of the lovely, warm summer days ahead!!! Your paintings look beautiful I can't wait to see the finished project. Your book sounds great. I sometimes think I've gone through life moving from one thing to another to know that it's ok it do that would be wonderful. Thanks for sharing. Ooooh i love that waterside painting Wendy.. beautiful work! I'm intrigued by your writing/painting project... i did a degree in creative writing and loved learning about how illustrations fit with narratives... i look forward to hearing more!! Your paintings look great - look forward to seeing the final project. I think my brain is a bit free-ranging in that it has difficulty settling on one thing. Hope you have a good week. 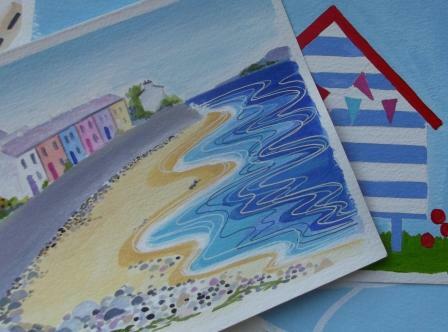 I love your beach painting too- love the white rippling lines in the sea. That book is just what I need! Sounds like me totally! I'm just experimenting with another new thing right now. This book sounds very interesting. The message is very motivating by itself. And so true! I love the freerange human idea and as my enforced break from organising workkshops continues I'm having more time to be creative and loving it! Will see if I can track down a copy of the book as it sounds right up my street. I love your beach painting - its exactly my thing, so excited to see more. And have now found and followed you on Pinterest too! I tried to comment but I think I messed up. Anyway, love this idea, Free Range Human. I may need to read that if I can stop ranging long enough!